As a group, it's our intention to create songs with a message of compassion and hope. They are for anyone facing a time of challenge in their life, whether it is grieving a loss - or on the journey to health and recovery. 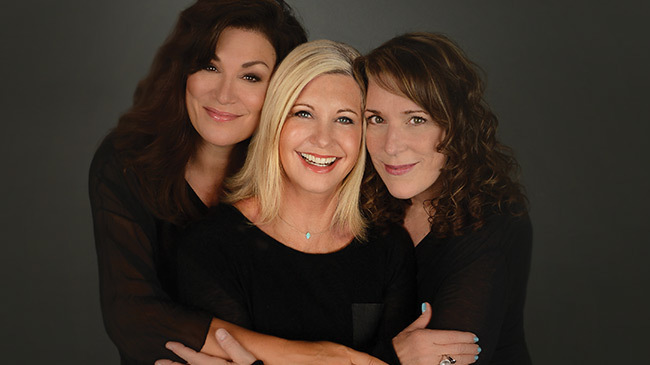 International superstar and multiple Grammy Award winner Olivia Newton-John, Grammy nominee Beth Nielsen Chapman, and SOCAN Award winner Amy Sky share their individual and collaborative journey in a magical event where they perform 11 newly recorded songs from their new album, LIV ON. In this one-of-a-kind performance, the audience will walk the path of joy, laughter and inspiration, finding amazement at the kinship generated by their experience. This very special performance will help lift the hearts of others going through their own hardship, whatever the cause. From the uplifting “Stone In My Pocket” to the poignant, “My Heart Goes Out To You,” LIV ON takes the listener on a journey of remembrance, toward one of inspiration and hope. LIV ON also brings listeners epic songs such as Beth Nielsen Chapman’s “Sand and Water,” and several brand-new songs, including the title track, “Live On,” which was born of their own exploration into the pain of loss, the growth that follows and eventually, the journey toward renewed joy. The LIV ON performance at City Opera House will not include any type of Meet and Greet.